Goodreads Synopsis: Cassidy Blake’s parents are The Inspectres, a (somewhat inept) ghost-hunting team. But Cass herself can REALLY see ghosts. In fact, her best friend, Jacob, just happens to be one. This short ghost story was a treat to read. Cassidy is a unique, interesting character who just happens to be able to see ghosts. No, she does not “see dead people” in a sense that they are visible all the time, she specifically needs to travel behind the “veil” to see the ghosts and their world. Well, all except for her best friend, Jacob, who just happens to be a ghost. We have no idea of his history, just that he saved Cassidy’s life when she had a near-death experience when she fell into the frozen river. Victoria Schwab manages to write so much in such little time. She has us involved in the world, and it becomes believable to her readers. Cassidy, Jacob, and the veil became real while I read Cassidy’s story. I was brought back to Edinburgh, Scotland again, but experiencing the more haunted side of things. The atmosphere that Schwab wrote with such detail had me experiencing the different scenes and visualising the ghosts in that setting as well. I found Cassidy’s parents, although unrealistic in behaviour, were too much fun. Cassidy’s mom was so funny and wanted so badly to believe in a connection to another world, but at times we saw just how far off that connection really was. Cassidy’s dad was so practical, basically, the complete opposite to Cassidy’s mom, that you spent time wondering just how accurate that rule of “opposites attract” really was. But the idea that they would allow Cassidy to have as much freedom as she had, or at least how much the reader felt she had, seems entirely unrealistic – or maybe that’s just me. I found myself laughing and tearing up during this story. There were laughing moments and then there were moments where your heart just breaks. There were tense moments, where you literally feel in peril because you’re not sure exactly what will happen to next. I found this to be a perfect fall read. 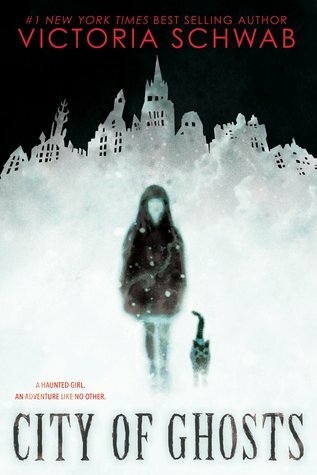 If you aren’t into scary books during this time of year, then City of Ghosts would be perfect for you. Yes, there are tense moments, and some even on the scarier side, but nothing too intense that I believe you wouldn’t enjoy it. Think Hocus Pocus (movie) scary – at least to my scale that’s where I would place it. Ok we can still be besties since you gave it 5/5! Of course! It’s so great – how could you not give it 5/5 🙂 Plus need my besties status.